Early mornings, hectic days, shifting priorities, achieving dreams - all part of our daily routine. When it comes to fueling our bodies with food, convenience is the dominant factor! Oh Yeah! 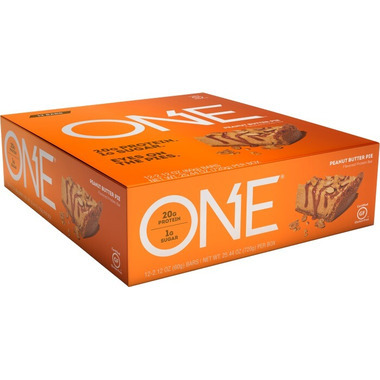 One bars were created to simplify your decision process, rewarding you with superior ingredients both nutritional and flavorful that will power some of the best moments of your life! Protein Blend (OhYeah! Blend Consisting of Whey Protein Isolate, Milk Protein Isolate), Isomalto-Oligosaccharides (Prebiotic Fiber), Maltitol, Glycerine, Peanut Butter, Peanut Flour, Peanuts, Palm Kernel Oil, Soy Lecithin (an Emulsifier), Natural and Artificial Flavors, Salt, Non Fat Dry Milk, Tapioca Starch, Calcium Carbonate and Sucralose. Contains milk, peanuts and soy. I use these delicious bars when I have an extra 6 sp left in a day on Weight Watchers. So good, chewy and filling. Tastes like the inside of a peanut butter cup...seriously.